Details of Dell’s new Latitude 10 Windows 8 tablet have been leaked online today, revealing whats behind its 10.1-inch 1366 x 768 capacitive multitouch display, and giving us a little insight into what you can expect when it arrives. 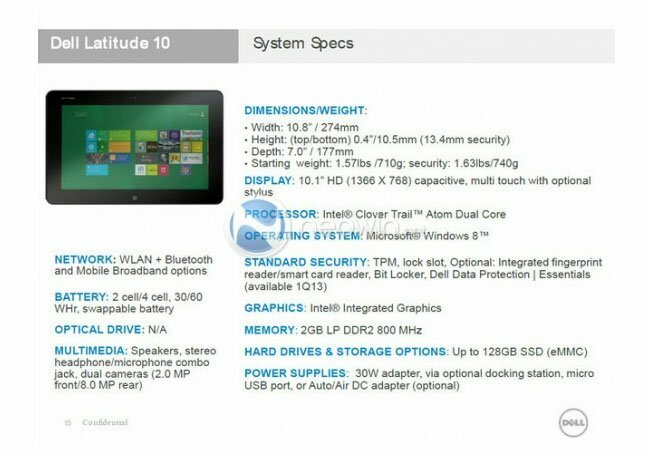 The leaked specifications reveal that the 10 inch Windows 8 tablet will be powered by a Intel Clover Trail Atom dual-core processor supported by 2GB of DDR2 800Mhz memory. Other features of the yet to be launched Dell Latitude 10 Windows 8 tablet include a stylus for writing and drawing. But is still unclear what type of stylus its is. i.e. rubber tipped like iPad styluses or a full active digitiser pen as on Samsung’s Galaxy Note 10.1. It also looks as though Dell will be offering a docking station for the Windows 8 tablet and two battery options, either a 2-cell, 30WHr pack or a larger 4-cell, 60WHr version, when its officially launched later this year.